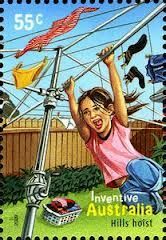 With recent news that Australian company Hills has sold the rights to its iconic Hills hoist clothesline, it is a good opportunity to reflect on the place this humble piece of suburban infrastructure has in Australian English. The Hills hoist is a type of rotary clothes hoist invented by the South Australian Lance Hill in his Adelaide backyard in the mid-1940s. 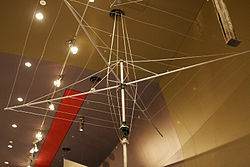 There were earlier versions and patents for similar hoists but it was Hill’s design, and the company he established, that would see the rotary clothes hoist introduced to backyards across Australia. The expansion of suburbia in Australia after the Second World War, a growing population, relatively large house blocks, and a sunny climate helped make the Hills hoist a household name. It was superior in every way to the old single clothesline strung across the yard and propped up by a stake. The compact design saved space, it was able to be raised and lowered easily, and it rotated to facilitate maximum drying and to allow the user to hang out the washing while standing in one spot. While Humphries’ comment is tongue-in-cheek, the iconic status of the invention is indisputable. What other nation around the world has a major display of rotary clothes hoists in its national museum? 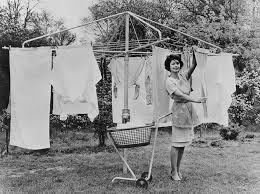 In recent decades the growing popularity of apartment living and the decreasing size of house blocks has seen the gradual disappearance of the rotary clothes hoist from the suburban landscape, replaced in the newer suburbs by clothes dryers and small pullout or folding clotheslines attached to the house or fence. Disappearing too are the opportunities for improvised entertainment. The kids playing in the new backyards will never get into trouble for swinging on the Hills hoist, there will be nothing to use as the frame for a makeshift umbrella, and young people will no longer be able to play goon of fortune (a party game in which the bladder of a wine cask is attached to a Hills hoist, the hoist is spun, and the person closest to the bladder when the hoist stops moving must take a drink). 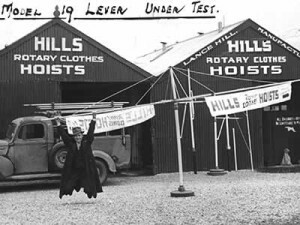 While the sale of the Hills hoist name may not spell the end of the Hills hoist clothesline, its role in Australian English may one day be a distant memory. This entry was posted in ANDC, children, urban Australia and tagged Barry Humphries, clothesline, goon of fortune, hills, hills hoist, rotary clothesline by Mark Gwynn. Bookmark the permalink.